I have always enjoyed supporting causes where a small thing that I do can make a big difference in someone else’s life. 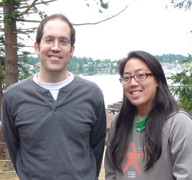 It is such with the Adopt-a-Student program, where my donation helps to fund a student to spend the summer taking classes and doing research at Friday Harbor Labs. Over the years I’ve met several of the students that I and many others have provided financial support for, and I’ve enjoyed hearing their stories about how they got interested in marine biology and related fields, and what they plan to do with their education after they finish their degree. The students come from all over the world, and have equally diverse plans for what comes next for them: from academic posts, to working for NGOs to protect the environment, to government or private industry work. It’s a great glimpse for me into what’s important for the next generation of scientists and what we can expect in the future. I also enjoy hearing the student perspective on FHL: what makes it such a unique place, the kind of work that the students were able to do here leveraging the Labs’ resources, and which courses and research activities were the most valuable to them. I also appreciate hearing from them about the challenges of coming here – financial, logistical, and otherwise -- which I think of as opportunities for us to help make the Friday Harbor Labs student experience even better. Being able to support the Adopt-a-Student program, and interacting with the students who benefit from the program, gives me hope for the future: I see smart, driven students who are passionate about the oceans and marine life, and who are getting a great education that will enable them to make the world a better place. Kevin is Chief Operations Officer for Microsoft Research in Redmond, Washington and a member of the FHL Advancement Board that he will chair later this year. He received his Bachelor’s degree in computer science from Dartmouth College and resides in Bellevue and Friday Harbor. If you are interested in participating in the Adopt-a-Student Program, please contact Rachel Anderson at 360-378-2165, Ext. 2 or make an online donation.